Tag line: "He came from hell. Don't ask him where he wants to go"
From the moment I started driving, people have been telling me it’s dangerous to pick up hitchhikers. But they have nothing to worry about, because thanks to director Robert Harmon’s 1986 horror / thriller The Hitcher, there’s no way in hell I’ll ever give a stranger a lift! Hired to deliver a car to a customer in San Diego, Chicago native Jim Halsey (C. Thomas Howell) starts to feel a bit groggy while driving through the desert one evening. Hoping that a little company will help him stay awake, he picks up a hitchhiker named John Ryder (Rutger Hauer). But instead of engaging in small talk, Ryder pulls a knife on Jim and threatens to kill him. To Jim’s surprise, his new passenger is a homicidal maniac, wanted by the police for a series of murders he committed along this stretch of highway. And by the looks of it, he intends to make poor Jim his next victim. Luckily, Jim gets the drop on Ryder and pushes him out of the car. But the next morning, just when he thinks he’s safe, Jim is horrified to discover that Ryder has hitched a ride with a young family. Jim does what he can to warn them of the danger, but to no avail; Ryder murders the family, then initiates a game of cat and mouse with Jim, who, try as he might, can’t dodge the maniacal killer. As the bodies continue to pile up around him, Jim goes to the police, only to find that he himself has become the prime suspect in the killings! Now hunted by both Ryder and the authorities, Jim eventually teams up with Nash (Jennifer Jason Leigh), a waitress he met at a roadside diner and the only person who believes he’s innocent. Nash has promised to help Jim escape, but the question is: can Jim protect Nash from the sadistic Ryder? One of Alfred Hitchcock’s favorite plot devices was that of the innocent man accused of a crime he didn’t commit (it was a theme the great director would return to time and again, in movies like The 39 Steps, Saboteur, and North By Northwest, just to name a few). Yet I’m fairly certain that even the Master of Suspense would be shocked by what happens to Jim Halsey over the course of The Hitcher. Whenever Ryder commits a new murder, he somehow manages to make it look like Jim is the killer. With its lead character simultaneously trying to outwit both a psychopath and the police, The Hitcher generates plenty of tension throughout. C. Thomas Howell delivers a solid performance as the everyman who was in the wrong place at the wrong time, yet it is Rutger Hauer as the demented Ryder who steals the show. Having already played the villain in a handful of early ‘80s movies (Nighthawks, Blade Runner), Hauer was the perfect choice to portray John Ryder, a madman who gets a kick out of killing people (“Do you got any idea how much blood jets out of a guy's neck when his throat's been slit?”, he asks Jim at one point with a smile on his face). Though he doesn’t have nearly as much screen time in The Hitcher as C. Thomas Howell, Hauer looms heavy over the entire film; even when we don’t see Ryder, we know he’s there, watching Jim Halsey every step of the way. 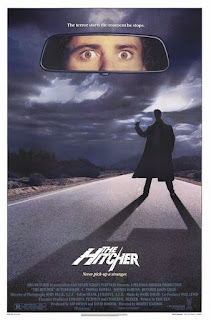 And that, more than anything, is what makes The Hitcher such a frightening motion picture. Like you, this movie guaranteed that I would never pick up a hitchhiker, either. Great review. I saw this in the theater, and the audience was really into the movie. I rented it a few years later because I wanted to see how much I could make my friends cringe and squirm. And, yes, it had kept me from picking up hitchhikers.